Home / Pak Info / Who Is The Current IG of Khyber Pakhtunkhwa Police? Q: Who is the Current IG of Khyber Pakhtunkhwa Police? He had even given away with his vast services in departments of CID as well as traffic, frontier reserve police and the Counter-Terrorism Force. Salahiddin Khan worked in these departments for almost two years. He is the native of South Waziristan agency. The main responsibility of the IG in providing the safety score and protection to the state or province in which they are working as the IG. IG is the abbreviation of Inspector General. Salahuddin Khan Mehsud is working as the current IG of Khyber Pakhtunkhwa Police department. Therefore, for the post of IG of Khyber Pakhtunkhwa, three names were sent to the Federal Government. This list adds up to the names of Akhtar Ali Shah, Salahuddin Mehsud and Inspector General National Highways and Motorway Police Shaukat Hayat. For two years he had served KP Counter Terrorism Department. Here you can also find who is the current IG of Balochistan Police? 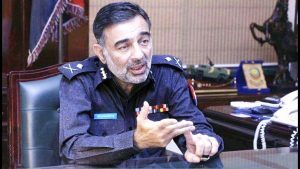 He had previously served in the Police Service of Pakistan since the year 1989. However, he is a true and honest officer. In addition, under his services, FIA, CID and terrorism department witnessed great improvement and corruption free results. Hence, a big development in Khyber Pakhtunkhwa is being expected after his posting.